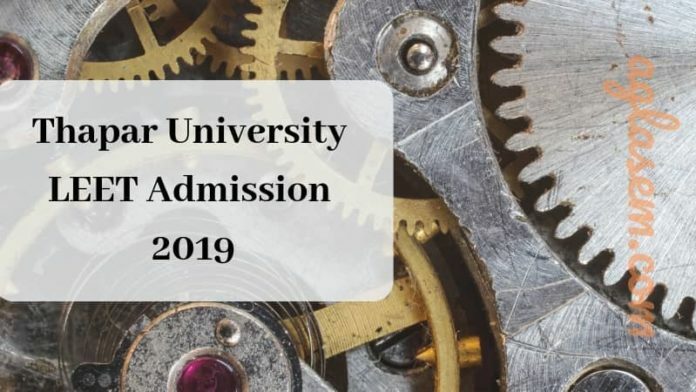 Thapar University LEET Admission 2019 – The admission process for the Lateral Entry Admissions 2019 in Thapar University has started, candidates need to register before June 15, 2019. Firstly, candidates have to fill the application form, wait for the admit card and then appear in the Thapar University LEET 2019. All the details for Thapar University LEET Admission 2019 have been notified on the official website www.thapar.edu. Through the Lateral Entry Entrance Test (LEET), candidates can get admissions to the second year of B.E. programmes at Thapar University. To know more on Thapar University LEET Admission 2019, candidates can scroll down and read the article written below. Latest: Thapar University LEET Admission 2019 Application Form has been released. Candidates can fill the form from the “Application Form” page. The candidates seeking admission to the second year of B.E. 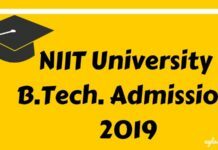 programmes at Thapar University through LEET-TU 2019 have to check the eligibility criteria, fee details, important details and all other relevant details for Thapar University LEET Admission 2019 below. The Thapar University provides admission in various branches of the engineering through the entrance exam. 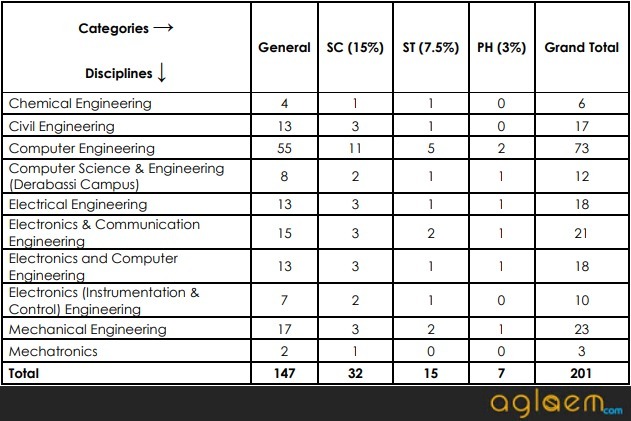 Candidates can check the pointers below to know the engineering branches. Candidates must go through the eligibility criteria as prescribed by the University for admission in the Second year of B.E. programs. No application invite of any non-eligible candidates would be accepted by the conducting body. Diploma, in the relevant discipline, of minimum 3-years duration after matriculation from Polytechnic College/Institute affiliated with State Board of Technical Education/University, or recognized by UGC/AICTE with a minimum of 60% marks (55% for SC/ST) in aggregate or equivalent grade point. A diploma, in the relevant discipline, of minimum 2-years duration after 10+2 from Polytechnic College/Institute affiliated with State Board of Technical Education/University or recognized by UGC/AICTE with a minimum of 60% marks (55% for SC/ST) in aggregate or equivalent grade point. The candidates applying for Thapar University LEET Admission 2019 need to fill the complete details in the application form available on the website of the university. In the application form, candidates have to fill the authentic details and submit it diligently. After submitting the online application form, the candidates need to take printouts of the filled in application form. As directed by the university, the candidates are requested to keep one extra copy of the printout of the application form as it will be required at the time of document checking during counselling. The candidates who are interested in taking admission in the second year of B.E./B.Tech programs at the Thapar University through LEET-LU 2019 need to pay a non-refundable application fee of Rs. 1500. If Application Fee is paid Online: The candidates are not required to send the printout of application form but they must produce it at the time of interview. If Application Fee is paid through DD, Candidates need to send the printouts by attaching DD of required amount as mentioned in filled online Application Form/Prospectus (in favour of Thapar Institute of Engineering & Technology and payable at Patiala) to “In-charge Admission Cell’ Thapar Institute of Engineering & Technology, Patiala (Punjab)-147 004. Thapar University issues the admit card to those candidates who have registered themselves to appear in the entrance exam. The Admit Cards for offline entrance test shall be sent to registered email IDs of the candidates. After registering, the candidate must take out two printouts of ‘TI LEET 2019 Admit Card”, paste the latest photograph on each and then appear in the Entrance Test Centre. Along with admit cards, the candidate will also carry any one of the identity proof (Original) such as Aadhar Card, Passport, Voter Identity Card, PAN Card, or Driving License. One copy of the admit card shall be retained by the entrance test center. The candidate shall keep the other copy (duly acknowledged by the examiner at test center) to be shown at the time of document checking during counselling. The question paper will contain multiple choice objective type questions of one mark each. Paper-I shall contain 40 questions in all with 10 questions in each of Physics, Chemistry, Mathematics and English. Paper-II shall contain 60 questions in the relevant engineering discipline each carrying one mark. Negative Marking: 1/4th marks shall be deducted for each wrong answer. Thapar University will release the LEET 2019 Result of entrance exam in offline mode. Candidates would be able to check their Result through the official website. The result would be available in the form of the merit list. Candidates have to qualify the exam as per the cut-off released by the University and then appear for the counselling session. To access their respective result, candidates have to log onto the candidate portal by providing the asked credentials. It is advised to take a print out of the result as it will be needed in the offline counselling round. After the result declaration, the final step is the counselling session. Qualified candidates will be called to appear in the offline counselling round at the allotted time and centre. Candidates have to bring the required documents for the verification purpose. During ’In-person counselling’ the candidates who have qualified the test as per the eligibility score notified on the website shall be considered and the admissions shall be made as per merit prepared on the basis of TI (Thapar Institute) LEET (Lateral Entry Entrance Test) 2019. NOTE: Along with the original ones, candidates also have to carry the attested photocopies of the above documents at the exam centre. The candidates admitted through LEET-TIET (2019) are required to deposit the fee and other dues as applicable to the candidates admitted in B.E. 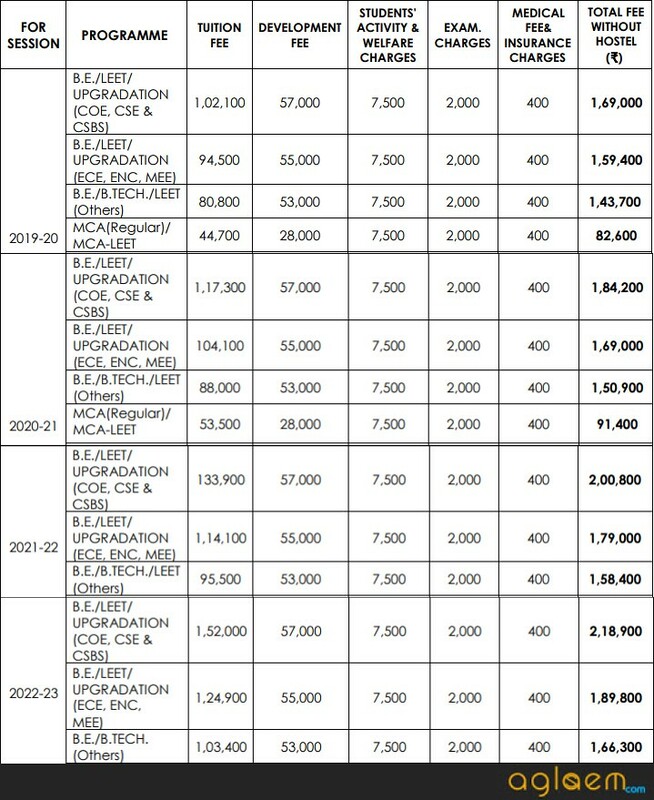 and B.Tech through JEE (Main)-2019 in the session 2019-20.The fees is provided below is of the current year as well as of the other years. For more information about Thapar University LEET Admissions 2019 refer to the previous year’s Information Brochure. 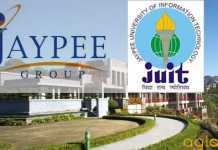 Jaypee B.Tech Application Form 2019 – Available! What will be the tution fee for BE civil after qualifying this LEET – TU exam? Currently I am pursuing BTech in computer science in first year from UPES Dehradun. Am I eligible for lateral entry in second year? What is the criteria?